Tel Hai Retirement Community invites the public to the ‘Understanding Continuing Care: An Educational Panel Event’ on Wednesday, April 3, 2019 at Noon. Planning for your future can be tough, and it doesn’t have to be. 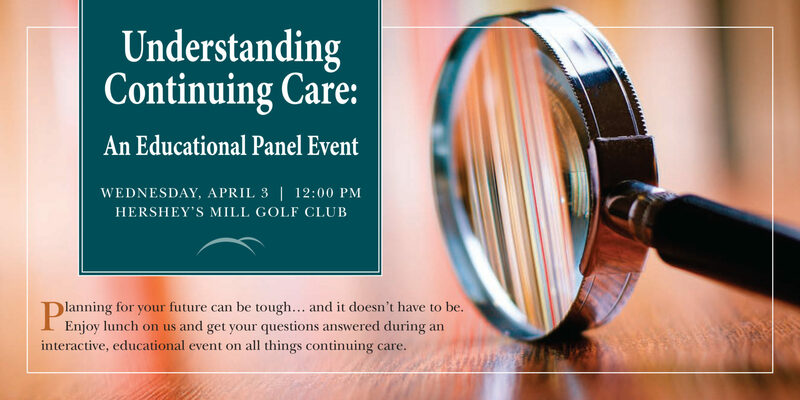 Enjoy lunch on us and get your questions answered during an interactive, educational event on all things continuing care. This panel discussion — composed of Tel Hai’s trusted and experienced team members — will explore the ins and outs of living at a Life Plan Community like Tel Hai, and you’ll learn about the full range of residential living options and health services. Event is hosted at Hershey’s Mill Golf Club, 1500 Greenhill Road, West Chester, PA 19380. The registration period for this event has now ended. Questions? Call Ginny at (610) 273-9333, ext. 2144, email info@telhai.org.